This time of year, so many people are caught up in the spirit of giving—from giving gifts to loved ones, to giving back to their communities. I can’t think of a better way to get into this spirit than by giving to the Free Library Fund. The Free Library Fund supports the programs that make the Free Library so amazing all year round, but if you give now, you’ll help us take advantage of an exciting opportunity. Our Board of Directors has agreed to match every gift to the Free Library Fund until December 31, up to $200,000! That means when you give today, your gift has DOUBLE the impact! We had a great year in 2018. More than 100,000 students got homework help at afterschool programs at the Free Library. 81 children from 47 families read with an incarcerated parent over video chat at neighborhood libraries. 68,703 people signed up for a new library card and gained access to a whole new world of opportunities. And with the support of generous Free Library Fund donors, we’ll do even more in 2019. You may not realize that many of our most beloved programs rely on private support. The City of Philadelphia provides for the operation of the Free Library’s facilities and infrastructure, but programs like Author Events, job-readiness trainings, special exhibitions, culinary literacy classes, and so many more are only possible with the support of generous people like you! Right now, your gift to the Free Library Fund will go twice as far! All gifts will be matched, but only until December 31. Don’t let this opportunity pass you by! It feels wonderful to give friends and family gifts they love. As I finish up my holiday shopping, I know I always love to keep the good vibes going all season long. 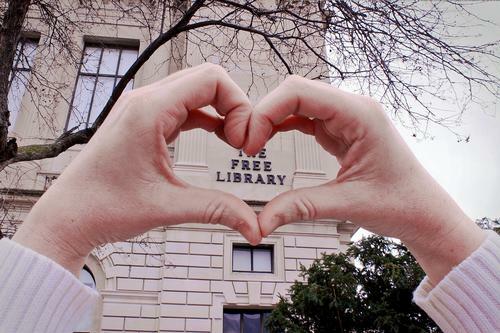 A donation to the Free Library Fund is one of the best gifts you can give our entire community. Supporters of the Free Library Fund help provide safe, supportive spaces for teens to gather after school. They empower New Americans to take English classes and apply for citizenship. They even help teach families to cook nutritious recipes by supporting programs in our Culinary Literacy Center! I hope you’ll join me in donating to the Free Library Fund this holiday season. Be sure to make your gift by December 31 and it will be DOUBLED! You’ll do twice as much good this year, so there’s no doubt you’ll make it onto the nice list. Give today! Families use the Free Library's resources in every neighborhood across the city! Add a Comment to Show Your Library Love This Holiday Season!